There are no "magic bullets to understanding" Lewis Hamilton's car issues, says Mercedes boss Toto Wolff. 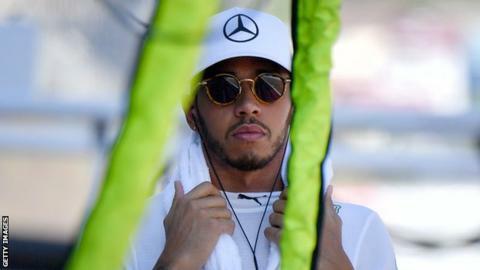 Three-time world champion Hamilton has won one of the season's four races and finished fourth at the Russian Grand Prix last time out. "Lewis had a difficult weekend in both qualifying and the race," said Wolff. "We've since been unpicking what happened to understand why we couldn't get the car in the right window so he could feel comfortable with it." Briton Hamilton said he was left mystified by his lack of pace as his team-mate Valtteri Bottas won in Russia, while Ferrari duo Sebastian Vettel and Kimi Raikkonen were second and third at the Sochi track. The result left Hamilton 13 points behind Vettel in the drivers' standings going into the Spanish Grand Prix, held in Barcelona on 14 May. "We must give him the tools he needs to do the job in the next races and that will be a big focus for us," added Wolff. "Barcelona will be interesting as our pre-season was not spectacular in Spain. It's a very different track to Sochi and we'll be running with harder tyres. "We are taking this season one race at a time. If we deliver the best possible work from Friday onwards, then we'll be ready to win and fight with Ferrari." Read more on Valtteri Bottas: Is Russia Grand Prix win start of things to come?